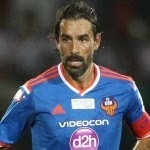 Arsenal legend Robert Pires feels the Premier League’s big names can be attracted to the Hero Indian Super League. The 40 year old is turning out for FC Goa in the ISL’s inaugural season. “Imagine today you have Del Piero, Trezeguet and Robert Pires – who knows in five or six seasons maybe you can have Rooney or van Persie playing in India,” Pires told Sky Sports. “When I retired and finished up two years ago – after eight months with Aston Villa – the Indian Super League organisers called me saying they had a big project. “They asked if I was interested and I thought why not. This is the first season for this league so why not try and help India to try and build this Indian Super League together.